When we think of bacteria, we automatically think “yuck.” Some bacteria, however, are actually good for humans and pets. These bacteria contain probiotics that have been found to help with digestion and keep your pet healthy. Note that not every pet will need or benefit from daily dosages of probiotics. For the most part, probiotics are recommended when your pet has digestive problems and may not be needed long term. Always consult your veterinarian for help deciding what is best for your pet, including whether probiotics can be beneficial. A well-balanced diet and exercise are vital to good health for pets. While it may be challenging to maintain a healthy human diet, pet owners can take steps to ensure our furry friends eat well balanced meals and get the right combination of protein, carbohydrates, fats and nutrients to maintain weight and stay healthy. Surprisingly, this also means making sure your pet gets enough “good” bacteria in their diet. Probiotics will help increase the production of “good” bacteria which can be reduced particularly if your pet is taking antibiotics. There are many types of “good” bacteria and each has a different benefit. Generally, probiotics helps maintain a strong immune system which is vital because the immune systems of dogs and cats are primarily based in the gut. Other benefits include better digestion and hormone production which promotes brain function. While scientists are not entirely sure how probiotics work, they do agree that probiotics are essential to maintain a healthy balance of “good” and “bad” bacteria in the body and also work to stimulate production of helpful bacteria. Since cats and dogs have different digestive systems and dietary needs, the need for probiotics differ. Many veterinarians believe that probiotics are more important to good feline health because of a cat’s anatomy and physiology. Also, different probiotics are recommended for dogs than cats, so it is important to identify the right types of probiotics for your pet. Cats benefit from types of bacteria in the Bifidobacterium and Enterococcus categories while dogs benefit from many of the same strains of bacteria, as well as Bacillus coagulans and Lactobacillus acidophilus. If this sounds confusing, now you know how your pet feels when you talk to them. Ask your veterinarian to explain probiotics or ask a pet care professional to help you identify the best probiotics for your pet. Similarly, since people’s stomachs contain very different bacteria from their pets, avoid giving pets probiotic supplements intended for humans. Probiotics are found naturally in certain foods. Unfortunately, probiotic rich foods such as sauerkraut, pickles, tempeh and kimchi are not the typical cuisine for pets. Yogurt is more pet friendly, but be sure to serve only plain, unflavored yogurt with no artificial sweeteners or added sugars. Pets also benefit from prebiotics, which helps probiotics stay active. Luckily, prebiotic foods include pet friendly choices like bananas, certain green leafy vegetables (particularly dandelion leaves), and apples, remember to remove any seeds before feeding. Probiotic supplements are readily available and come in tablet form, powder, chews or infused inside of food and treats. There is debate regarding the stability of probiotics which refers to the fact that the bacteria must be “live” when ingested in order to be effective. As a result, some probiotic supplements must be refrigerated. Exposure to air and water should also be avoided. However, many brands of probiotic supplements are “shelf-stable” and do not need to be refrigerated. Like any supplement, effectiveness depends on proper storage and dosage; so regardless of whether the probiotic supplement is required to be refrigerated or not, always follow the instructions and make sure you are purchasing a trusted brand. Finally, be aware that introducing new foods or supplements in to a pet’s diet may result in side effects. Consult your veterinarian before supplementing your pet’s diet with probiotics. Also, be sure to monitor your pet for unusual behavior or signs of discomfort. The proper dosage of probiotics will depend on the pet’s weight, their needs, and your pet’s overall health. Generally, dosage is based on a probiotic’s CFU (colony forming unit) count which corresponds to the living bacteria in each serving. Labels will indicate the CFU count. Depending on the pet’s weight, probiotic dosage will vary from 1-5 billion CFU. This amount can be given twice daily with meals. Dosages will be increased or decreased based on your pet’s needs and health. For example, when your pet has diarrhea, probiotics are not recommended. Whether you only use probiotics for a pet’s specific condition or whether you decide to add probiotics to your pet’s daily diet will depend on the needs of your special pet. Identifying and maintaining the best diet for your pet requires a bit of research and consultation with your veterinarian, particularly if your pet has special health needs. At a minimum, read food and product labels carefully. Also consider your pet’s breed, age and other characteristics that make your pet unique. 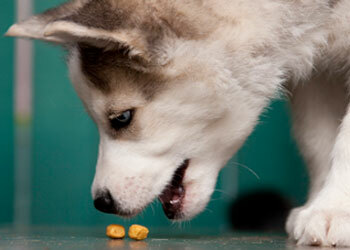 All these factors will help you chose the right food for your pet. Probiotics can provide a variety of benefits to your pet and help your dog or cat stay healthy.